Bonjour and welcome to my second French Friday post! 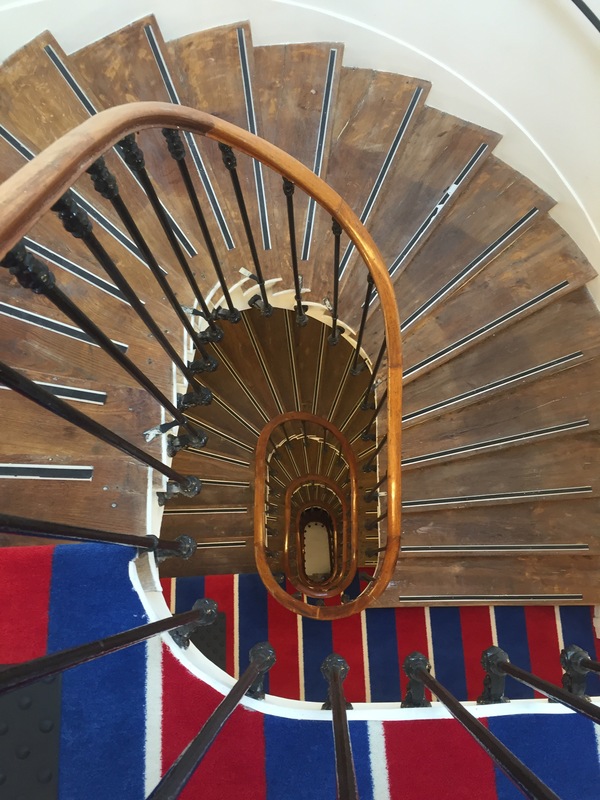 Today’s post is about my new favorite boutique hotel and boutique hotel chain in Paris. I wanted to post about Hotel 34B by Astotel shortly after my Paris Photo Travel Diary post but I didn’t have time and then forgot. When I remembered to post about it, I realized I didn’t take any pictures of our room and decided not to. But we really, really enjoyed our hotel stay here back in May 2016 that I wanted to share our experience. I found Hotel 34B from the good reviews on Tripadvisor. It was a bigger bonus that the hotel was reasonably priced compared to the Airbnb options we were looking at. So I booked a triple room, which stated that they had a sofa bed, or in this case, a cot. I wanted to make sure Luke had his own place to sleep. The hotel is located in the 9th arrondissement near the Grands Boulevards metro stop. We’ve never stayed in the 9th arrondissement before and after staying at this hotel, I think it’s our favorite neighborhood in Paris. Although we stayed in a hotel, we felt like we were staying in a neighborhood where all the locals lived. It didn’t feel very touristy, which I loved. We arrived early so our room wasn’t ready. The staff was very nice and accommodating giving us coffee and pastries in the lobby area. Our room was big by European hotel standards. There was a little nook area for Luke’s cot. I really wished I took pictures of our room but when we arrived, we were so jetlagged, all we did was unpack and took a little nap. And when we were all wide awake, the room was a mess and I was embarrassed to take pictures of our mess. I managed to take one picture of Luke on his bed (with only his underwear). But you can trust me on the room size – for a triple room. I’m glad we booked this hotel and thought this hotel outweighed some of the Airbnb options we considered at the time. So if you’re considering a hotel for a family stay in Paris, I’ve included some things you may consider, especially for this hotel or other hotels managed/owned by Astotel. The location. The hotel is a few blocks from the Grands Boulevard metro stop, close to Galleries Lafayette and Primtemps for shopping, including the Sezane apartment. There are lots of restaurant options and a few blocks from the famous A la Mere de Famille chocolate store. An added bonus, a Monop store is located around the corner for all our snack needs. It’s very kid-friendly. The hotel has toy cars in the lobby for Luke to ride on and play with, including the trojan horses. Upon check-in, they gave Luke some toys and books to take with him to the room. The hotel also has a shelf of children’s books (in French) in the lobby for kids to take and read. Complimentary breakfast and snacks. I’m not one to cook and when I’m on vacation, I don’t want to think about cooking. The complimentary breakfast and snacks during the afternoon and evenings worked with our schedule. Knowing that breakfast was ready gave us incentive to get out of our room by a certain time. French hotel design. The hotel’s theme is an “Ode to France”, which helped make my decision to stay here even easier. Not only were we in Paris but this hotel was everything French for this Francophile to swoon over. The lobby and common areas are very photogenic and instagrammable. Since we booked a triple room, our hotel room was spacious for a family of three and had the perfect amount of French detailing. You might get a little dizzy walking down the hallway though…Luke loved it. Great value. Hotels in Paris can be expensive, especially if you stay at some of the large chain hotels. I’m starting to love boutique hotels because they are smaller hotels that offer so much more for your money, including free wifi, breakfast (already mentioned) and are in great locations. Friendly staff. All the staff here spoke English but it was fun to practice my French with them. There’s something about returning to a hotel in the evening, the hotel staff remembers you and welcomes you back. It felt like coming with a friendly smile. Yes! Oui! Yes! Let’s meet up here in Paris!! That would be so fun! BTW – Our meet up needs to happen soon!!!!! Happy Friday, Lauren! Thanks! It was a pleasant surprise to stay here! You should check it out when you’re in Paris!